Enrich your casual breakfast area with this 3 piece dinette set. Constructed of solid Rubberwood, the round table features a java finished top. 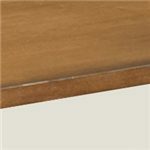 Two drop leaves allow you to modify the table to best suit your dining needs. 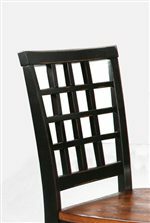 Slat back side chairs complete the look of the silhouette. These chairs also embody a two-tone look. Clean, tapered legs and smooth edges offer simplified charm that will bring a refreshing look into your home. 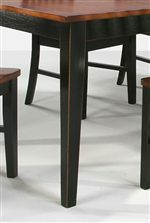 The Arlington 3 Piece Dining Set with Two Drop Leaves by Intercon at Gallery Furniture in the Oregon, Portland, Clackamas, Washington, Beaverton, Northwest, Vancouver area. Product availability may vary. Contact us for the most current availability on this product. 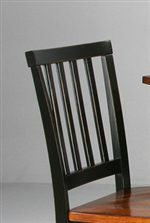 The Arlington collection is a great option if you are looking for Mission furniture in the Oregon, Portland, Clackamas, Washington, Beaverton, Northwest, Vancouver area. 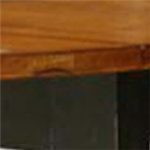 Browse other items in the Arlington collection from Gallery Furniture in the Oregon, Portland, Clackamas, Washington, Beaverton, Northwest, Vancouver area.